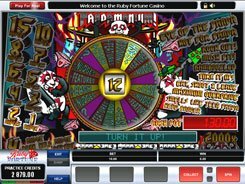 This hellishly red slot machine has a simple arrangement of three reels and one payline, but its simplicity is deceptive as it offers some offbeat features. Winning combinations are formed with Vegas-style cherries, bars and sevens. 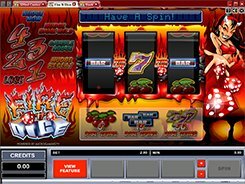 To stay within your budget, you can bet $0.1 to $10 per line, per spin. 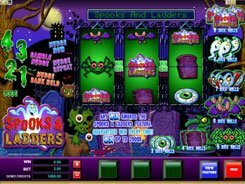 The top jackpot win is 500 coins awarded for three dice with six dots on each. 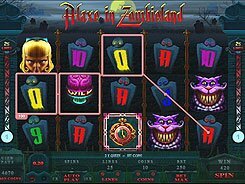 If you play for real money, your cash award will depend on the coin denomination you selected before each winning spin. So the higher you bet per line, the higher your reward is. 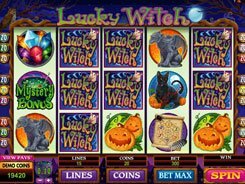 Whenever three of any of the aforementioned symbols land on the payline, the slot activates a free games feature. 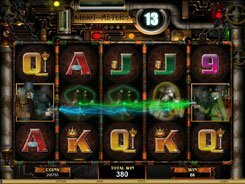 The free spins are rolled on the second screen that shows up three bonus reels with five paylines. 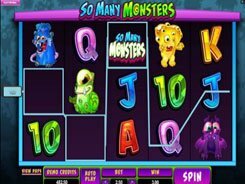 There you can win big jackpots and bet multipliers based on your original stake in the main game. PLAY FOR REAL MONEY!